Bloedel Conservatory in Queen Elizabeth Park. The second-largest geodesic dome in the world. Location for "The Gamekeeper". Shadow in Queen Elizabeth Park. 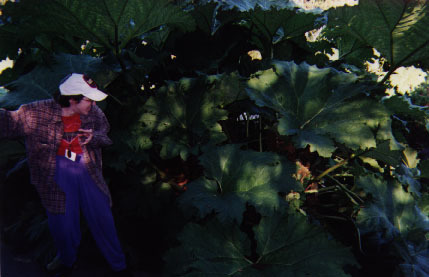 Giant Alien Plant Attacks Roomie! Vancouver Space Centre. 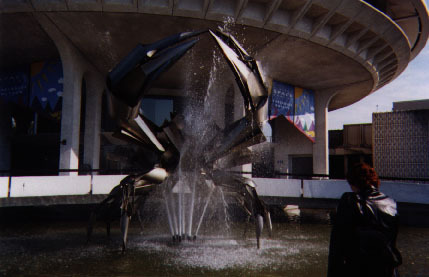 It's coincidence that the fountain sculpture looks like a replicator bug, but I'm suspicious... ;-) The auditorium inside doubled as an Air Force Academy lecture hall in "Prodigy"; McMillan Observatory, on the grounds, was seen in "1969". Patio of the Old Bailiff Restaurant, from above. Location for the cafe where Sam met Maybourne in "Foothold". 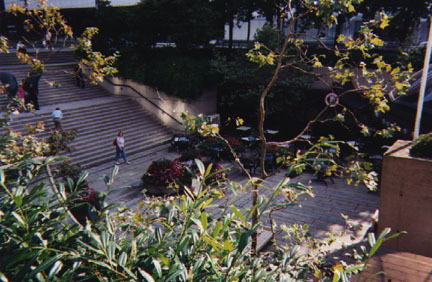 Steps leading from the Vancouver Art Gallery (in background) down to Old Bailiff. This spot doubled for Washington, DC when Sam and Jack were walking to the reception in "Secrets". You can also see the eagle over Sam's shoulder in the cafe scene in "Foothold". 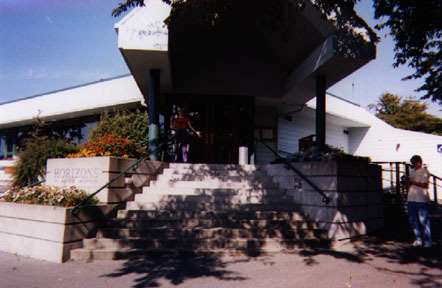 Building at the Plaza of Nations. Location for the 'gateport in "2010". Outside at the Plaza of Nations. Location for the planet where Teal'c got bitten by a Really Big Bug in "Bane". Big honkin' fallen tree trunk near the Plaza of Nations. 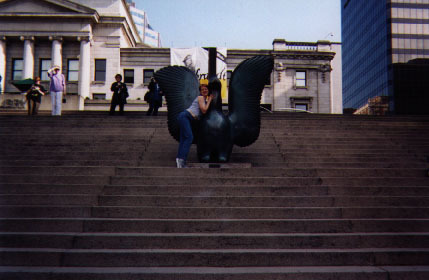 Of course I had to climb it. It was there. 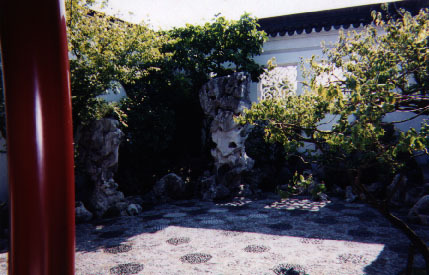 Sun Yat-Sen Gardens. Absolutely stunning formal Chinese garden. 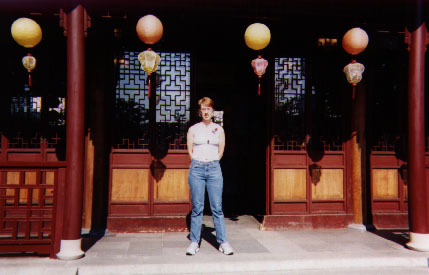 Location for Kheb in "Maternal Instinct". 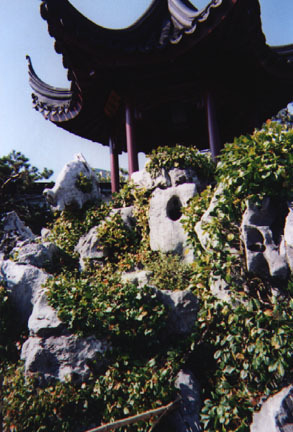 Rock formations in Sun Yat-Sen Gardens. 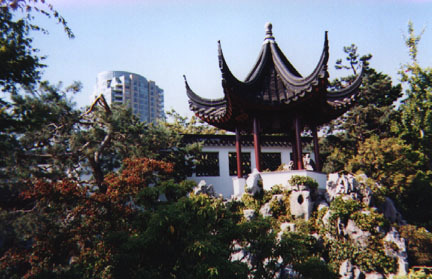 Pagoda in Sun Yat-Sen Gardens. West meets East, new meets old. 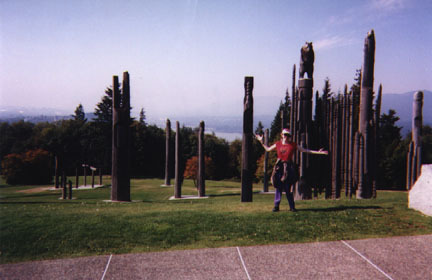 Shadow with Ainu totem poles on Burnaby Mountain. 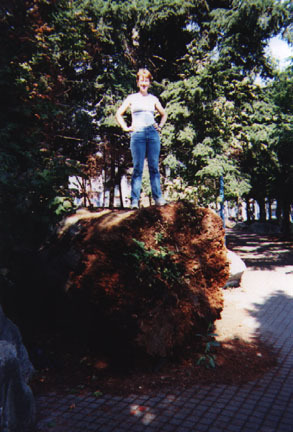 Highest point in metro Vancouver. Location for the planet where Apophis was building his new warship in "Upgrades". 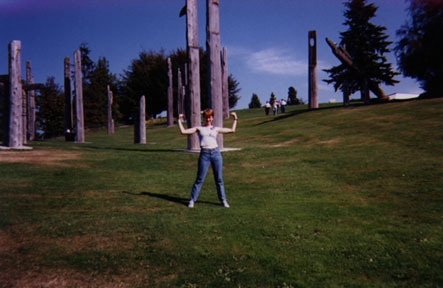 I'm shrinking again... Nope, the totem poles are just really, really tall. Bring on the Serpent Guards! Oh, wait, I lost my armband... Shadow at Horizons restaurant on Burnaby Mountain, location for O'Malley's in "Upgrades". In spite of the hours posted, it was closed. 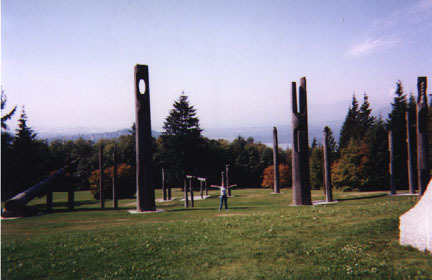 Wonder if SG-1 is in trouble again... ;-) Simon Fraser University, also on Burnaby Mountain. 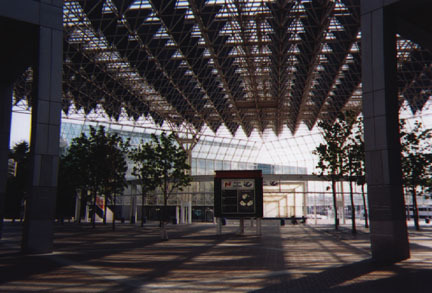 Location for Tollana in "Pretense" and "Between Two Fires".